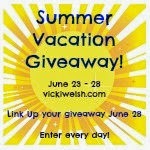 Vicki of 'Field Trips in Fiber' has been doing a Summer Vacation giveaway this week and has asked that we join in and have our own giveaway today. I thought I'd take part and offer one of my little faux china-head dolls I posted about the other day. You can choose either one with the blue skirt or the one in the middle and, in order to have your name entered you have to tell me what your favourite thing to do in the summer is and why. Get your comments in on this post and I will draw a name on July 4th. Quote for today, from George Horace Lorimer..... "It is good to have things that money can buy, but it is also good to check up once in awhile and be sure we have the things money can't buy"
Giving you a head's up before you start reading this.....there is a little bit of 'language' so if you don't like the use of a certain 3-letter 'a' word used in reference to what you sit on, don't read any further. Warning # 2....be prepared to laugh. Seriously would suggest a trip to the bathroom before reading. I found this posted on one of the knitting groups today and I have to admit I laughed til I cried. It's simply too good not to share. Today's quote is from Lewis Mumford.... "Humor is our way of defending ourselves from life's absurdities by thinking absurdly about them"
Today was our monthly CQTeers meeting and the theme for our ATC swap was 'buttons'. Sue created the one on the upper right - button is made from a wine cork. Irene did the ones on the bottom - tiny Dorset buttons (impressive to work them that small! ); and I did the one on the upper left (commercial buttons, with vintage paper). The quote for today is from John Fischer.... "Let's assume that each person has an equal opportunity, not to become equal, but to become different - to realize whatever unique potential of body, mind and spirit he or she possesses"
We started talking about the advantages of getting a bigger car. Talking was all it was. So how come this came home with us? It's a 2011 Toyota Rav4 and we love it! Love it even more with the addition of the racing stripe down the side, which makes it a whole lot easier to find in a parking lot! it's okay to tell me we're crazy. Today the quote is from W. Clement Stone.... "There is very little difference in people, but that little difference makes a big difference. The little difference is attitude. The big difference is whether it is positive or negative"
Their skirts are made from ladies hankies and their heads (and shoes) are painted and varnished to resemble antique china-head dolls. My own design. Today's quote is from Leo Rosten.... "I think the purpose of life is to be useful, to be responsible, to be honorable, to be compassionate. It is, after all, to matter: to count, to stand for something, to have made some difference that you lived at all"
First of all I want to tell you that I have finally finished the 'Secret Project #2' and will be returning to working on my white cloth and a few other projects that have been waiting for attention. Who knows, there might be pictures to share! 1. 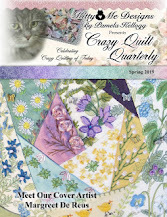 For those of you who are crazy quilters, you might like to have a look at THIS. You can find free printable block patterns that include lovely little pictures courtesy of Janet Stauffacher. I know some people are timid about creating their own blocks so this will help out with that. Be sure to scroll down (and check out the 'older posts' at the bottom as well). Lots to keep you busy! While you're there, have a look in the online catalogue HERE. 2. Kathy Shaw has been creating and testing out a marvelous free standing embroidery hoop and is selling them in her online store. You can read more about it HERE. There's a storm rolling in so I'd better get off the computer, just in case! Today's quote from Paul Theroux.... " The journey, not the arrival, matters; the voyage, not the landing"
.....the great secret project of 2014!! I put the last stitch into it today and there's just some finishing details to complete and it will be done. That means that this blog will return to the previously scheduled programming! Exciting, huh? I've been meaning to show you a couple of things I've added to my stitching arsenal over the past while. The first one is a set of threads and bobbins that I picked up through the Regal catalogue. It's amazing how often I need just a little bit of thread in a certain colour and this kit is just the ticket. Each colour has a matching pre-wound metal bobbin. Who sez adults can't play with toys meant for children? This lovely little light box is manufactured by Crayola and is meant for kids to use to trace pictures to colour. It works just as well to trace stitching patterns for stitchers. Bonus! Today's quote from anonymous.... "Life is in the living, every hour of every day"
Way to go Chrissie!! It looks wonderful! Today's quote is from Andy Rooney... "The two biggest sellers in any bookstore are the cookbooks and the diet books. 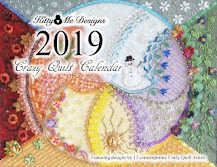 The cookbooks tell you how to prepare the food and the diet books tell you how not to eat any of it"
Everybody knows that crazy quilting is my 'thing' and sane quilting doesn't enter into my realm very often. I stumbled across this cute 'bug' fabric in our local store and just HAD to buy it for our grandson. Daddy (our son) is rather strange in his likes and threatened me that there was to be NO baby blue or baby pink for any kid of his. Well - bugs outta fit the bill, don't you think? Please don't look at my quilting efforts too closely! a pretty iridescent pre-made bias binding. Bonus!! Today's quote, author unkown, .... "Life is not a someday thing or a one day thing. It is a right now, every day thing"
First of all I want to thank those of you who took the time to make suggestions about tracking down the crazy quilt hussif/pursif pattern by Julie Craig. It appears she is still in business, but unfortunately doesn't seem to have a web site. I will keep trying! Secondly...I know I've mentioned Mary Corbet to you more than once. Her blog is very informative and covers many topics of interest to stitchers. Her latest couple of posts are about the use of vintage threads in your work. The latest one discusses how to clean and condition old threads and is well worth reading if you happen to own some. HERE she discusses the use of old embroidery threads. While you're visiting her site, be sure to take time to look around at all that Mary has to offer. You'll find all sorts of good information and instructions concerning embroidery of all sorts, free patterns, and just a treasure trove of goodies! The weather is finally warming up here and today it's trying to rain. Never thought, after all that snow that had to melt off this year, that we'd be hopeful for rain! It's a good day to stay inside with needle and threads in hand (and also wait for the superintendent to arrive to instal a new ceiling fan/light in my studio). Hopefully he comes today before it gets too hot! From E.E. Cummings.... "To be nobody but yourself in a world which is doing its best day and night to make you like everybody else means to fight the hardest battle which any human being can fight --- but never stop fighting"